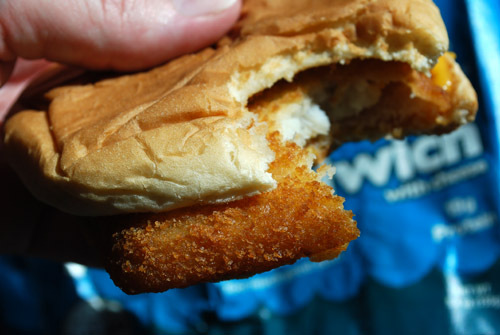 It’s been a while since my last Friday Fast Food Fishtacular, mainly because I’ve exhausted all the fast-food fish sandwich offerings in the tri-county area. In fact, I was considering a series of critiques on fish tacos/fish burritos, but that could escalate into shrimp po’boys or tuna melts. No, fish sandwiches are my jam. 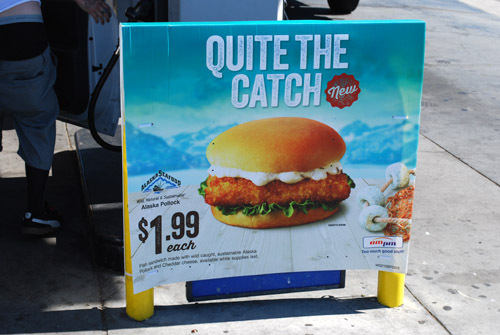 Last week, I was completely taken off guard by a new fish sandwich from a most unlikely chain — AM/PM. Actually it was Darlene who spotted the banner ad as we were waiting for a green light, and I was instantly intrigued. 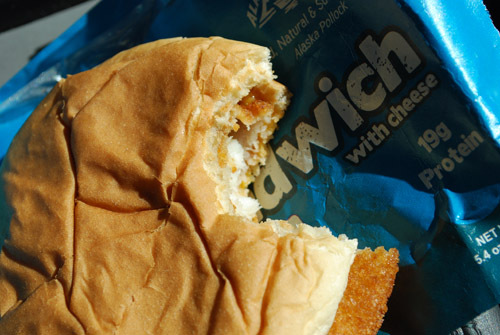 First: How did AM/PM crack the fish sandwich code that fast-food chains held in complete secrecy for half a century? Second: How fresh/tasty could these sandwiches possibly be, in the absence of a deep-fryer or skilled fishmonger? 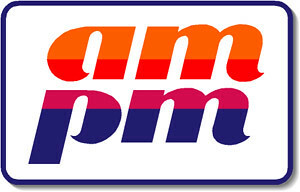 Third: Is AM/PM considered “fast food?” I figured $1.99 (+ tax) would give me some answers. Of course the fish sandwich was served in a foil hotbag in their self-serve heatlamp box (where their burgers, dogs etc. reside). It had a cryptic expiration time on the bag, which said “Enjoy by 1:30” but “5:00” was circled on the clock. Seeing as how this was about half-past noon, I had no idea what any of this meant. I applaud that they try to make these as fresh as possible, but the problem is right in front of me: are we talking AM or PM? Was it made at 1:30 AM? Would I die if I ate it after 5:00 PM? And isn’t 5:00 PM technically before 1:30 AM the following day?? It’s the Gremlins Paradox: Don’t feed Gizmo after midnight… but isn’t 8:00 AM after midnight? WHAT DO I DO?? From the initial reveal, it certainly looked like a fish sandwich, probably not too far off from what you’d get at the university’s dining commons. According to the bag, it’s a deep-fried slab of Alaska pollock with a slice of processed cheddar cheese. What it DIDN’T have was a fat blanket of tartar sauce or a beautiful bed of lettuce (see banner ad photo up top for reference). Maybe I missed the lettuce bin and the tartar sauce pump bucket? What it DID have was a curious case of shrinkage. 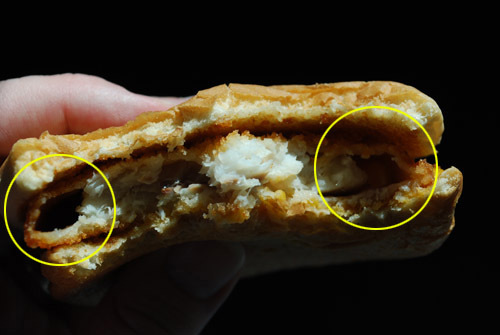 In the above photo I highlighted two areas of the fish patty where the fish actually shrunk within its deep-fried coat of breading. Weird. Your results may vary. Onto the eating experience itself — it was not as horrible as I imagined. (AM/PM, if you’re reading this, feel free to use that sentence as a testimonial in future ad campaigns. You’re welcome.) The geometric fish slab was crispy and tasted fine, the bun was soft and not stale/dried out from the hotbag and the pasteurized and processed cheese tasted as you’d expect from its description on the back. A week later, I’d say the takeaway was a cheese-flavored sandwich with some fish essence. Certainly not worth two bucks or whatever regrets you’d have afterward. 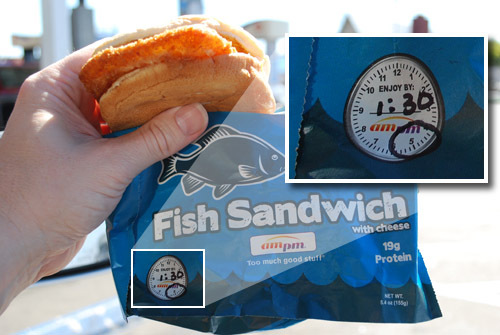 The AM/PM Fish Sandwich has 357 calories and 8 grams of fat. Surprisingly, that’s fewer calories and fat than the Jack in the Box fish sandwich, but that apparently reflects the absence of tartar sauce. The ball’s in your court, 7-Eleven. Eating fish at a convenience store seems like a good way to create the Perfect Storm in your gut. Its not a bad sandwich for $2. I wish they wouldn’t put cheese on it though.